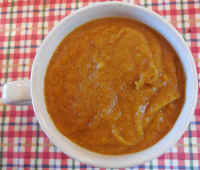 Carrot parsnip turnip curry soup is a spicy vegan recipe for lunch or dinner. This recipe will serve 4 to 8 adults depending on the cup or bowl size. Preparation time is about 20 minutes and cooking time is about 35-40 minutes. Leftovers can be stored in a covered container in the refrigerator for several days without losing its flavor. Begin by washing, trimming, and peeling the veggies, as needed, and cut them into medium size pieces and place them in a large microwaveable covered baking dish, and cook in the microwave oven for about 30 minutes at 1000 watts (mixing every 10 minutes), or until the veggies are tender. The veggies can also be cooked in a conventional oven at 350 degrees F., but the cooking time will be longer. When the veggies are tender, transfer some of them into the container of a high speed blender. add some water to fill in the voids between the veggies in the container to aid in blending, cover, and run the blender at high speed until the contents are smooth. If there are still veggies in the baking dish, transfer them into a mixing bowl, and pour the contents of the blender container into the baking dish. Repeat the process until all the veggies are processed. Add the seasonings to the blenderized soup in the baking dish and mix well. 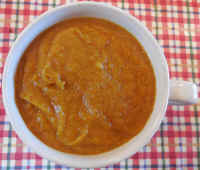 Cover the baking dish, and cook for another 5 or more minutes to reheat the carrot parsnip turnip curry soup and blend the flavors.